While Furniture shopping I was a little surprised by the number of Buddha heads for sale. Not that I've anything against Buddha, but it seemed as though every store I entered had a sculpture or painting (or several) of one kind or another, available for purchase. Even in the office supplies outlet, large format prints on canvas of the Buddha's face were hanging on the walls, tastefully done in gold or grey monotone. Living in a predominantly Christian neighbourhood, I wondered, how many of those who purchased a Buddha's head were aware of the Buddha's teachings? How many followed the Eightfold Path or understood the Four Noble Truths? These particular items, on sale post Christmas, were most likely destined for patios and porches, poolside decks and book keepers reception areas. Do Buddhists, in kind, decorate their backyards and bar-be-que areas with Crucifixes and effigies of the Virgin Mary? 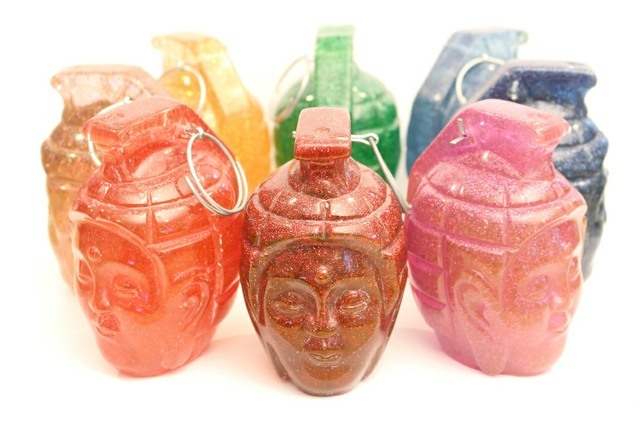 A reaction to ubiquitous retail displays of Budda, these small sculptures merge Buddha’s peacefulness with the explosiveness of a hand grenade. Their disguised violence is a metaphor for the economic oppression wrought on low socioeconomic demographics with income levels inversely disproportionate to high mortality rates, inaccessibility to essential services and exposure to disease and infection.